Think of middle England and a patchwork of green fields, gently rounded hills and lush valleys springs to mind. Warm stone cottages with roses overhanging mullioned windows and natural wooden doors complete the picture. The only mountains to speak of are the distant silhouettes of the Malvern Hills, guarding the fruit and vegetable landscape of the Vale of Evesham from the marauding westerly winds. Broadway in Worcestershire is the gateway to the Cotswolds, a veritable centre of tourism offering much of the best that Britain has to offer; yet overlooking the picturesque honey stone of Broadway, high on a ridge once favoured by ancient travellers can be found Snowshill. No doubt very appropriately named for winter; but in summer travellers to this scenic viewpoint inevitably pinch themselves for fear of believing they had passed through some form of traveller’s time warp. Here, from June to early August, the landscape of Snowshill refuses to embrace the lush green folds of middle England and takes on the warmer tones and scents of Provence. Here rows of lavender stretch across the southern facing slopes. Rich deep purples, subtle blues, the occasional pink and even whites cover 53 acres. 250,000 plants and 70 miles of rows resting on the shoulders of the Worcestershire hills and revelling in the free draining limestone soil at 1000ft above sea level. On a warm summer’s day and a cloudless sky the temperature too can sometimes match that of Provence but that is perhaps a rare occurrence. 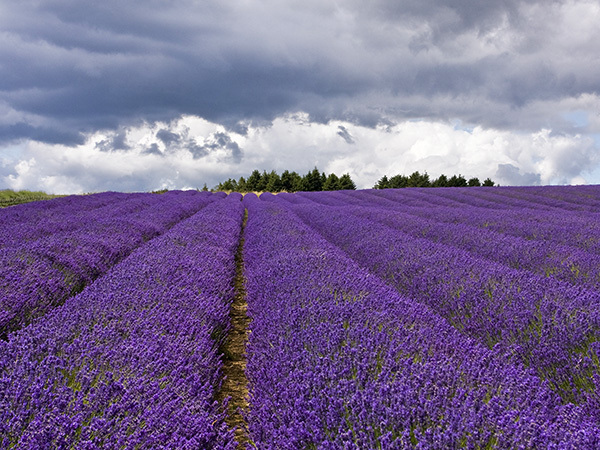 Nonetheless the colour and spectacle of this sea of lavender even under threatening skies provides a memorable sight. Snowshill Farm is described as a third generation family farm but the lavender production started as recently as 2000 with just a few plants. Now with proven growing conditions the crops of lavender are harvested and steam distilled on site using a process derived from a century’s old practice providing a quality range of English lavender oils and toiletries. Lavender is of course by nature a Mediterranean plant and perhaps the most popular of aromatic plants renowned for its perfume and aromatic virtues. The word ‘Lavender’ is thought to have come from the verb ‘lavare’ meaning to wash. However, it may also have been the Latin word ‘livendula’ meaning bluish from which it gets its name. Certainly it is known to have been in use for over 2500 years, originally by the Egyptians and Phoenicians for mummification and perfume. The Romans also used lavender to scent their baths and laundry. Traces of the herb were also found in Tutankhamen’s tomb when it was opened in 1922 and after some 3000 years it was said to have still retained a hint of perfume. Lavender has also been described as the essential ingredient of aromatherapy, since from the beginning of time it has been used for its medicinal properties, becoming the main ingredient favoured by French chemist René-Maurice Gattefossé who provided the modern world with aromatherapy in 1928. While working in his laboratory he badly burned his hand and after applying lavender oil to the burn found the pain very quickly disappeared followed by rapid healing without infection or scarring. In the early days of course it was a wild plant growing on rocky outcrops and limestone soils, picked by passing Provencal farmers and shepherds who sold it on to the perfumeries in Grasse. Just before the 1st world war the French government envisaged lavender production as a means of retaining labour in and around Grasse resulting in many almond orchards disappearing in favour of lavender cultivation. Since the 20th century has it been cultivated, harvested and distilled to produce the fine lavender much sought after by perfume makers. 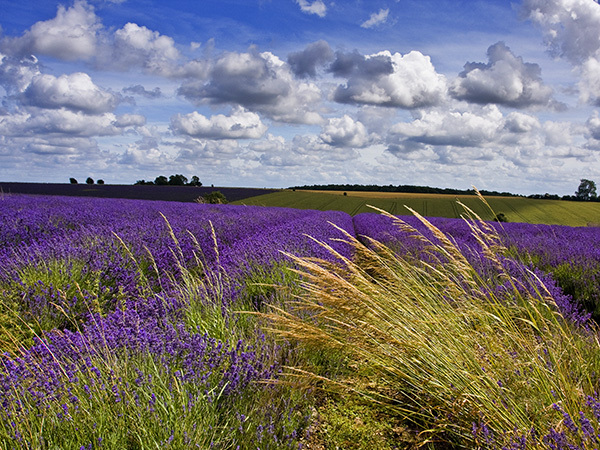 Lavender cultivation in England is by no means a modern introduction. It is thought the Romans brought Lavender to these shores although it is possible that Phoenician traders may have imported it here first. Certainly the Romans were the first to cultivate it for its cleansing and healing properties. Apart from healing, Lavender also played its part in English folklore when crosses made from the flowers were hung on doors to ward off evil spirits. It was also worn as a wrist band during the great plague and during outbreaks of cholera. 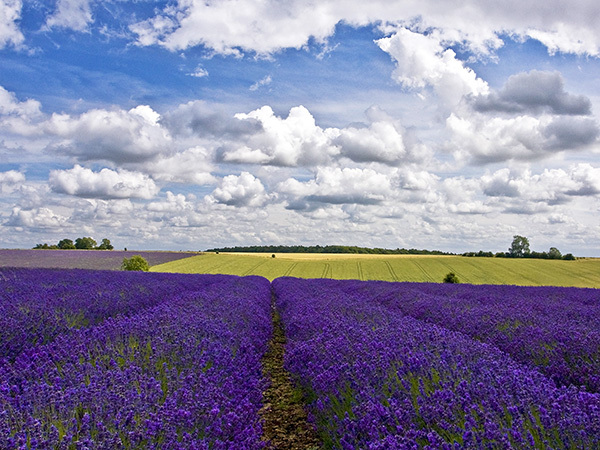 Monks soon farmed lavender for its herbal properties and in the flavouring of meats while many south facing chalk slopes were transformed into the main lavender industries of England. London was once regarded as the Lavender capital of the world where fields of lavender grown around the Carshalton area provided the essential ingredient for major companies like Yardley. There was even a lavender farm at Broadstone in Dorset on a hillside overlooking Poole harbour. In the early 1900’s however, the industry declined as Mediterranean production became more prominent and land was developed for housing. Today however, Lavender farms are re-emerging across the country and some of the fields around Carshalton have given re-birth to the production of lavender. This aromatic plant has always been a victim of fashion and was recently considered as ‘old fashioned’. Once again relying on its natural aromatic and medicinal properties to relax an increasingly stressful nation it is clearly enjoying a well deserved renaissance. As our natural climate warms maybe the green fields of England will one day rival the fields of Luberon and Vaucluse where delicate mauves and bright purples will waft gently in the summer breeze under an azure sky. Painters and photographers will discover vistas previously captured in the foothills of Provence and the Vale of Evesham just might stretch its purple lines towards the distant blue of the Malvern Hills.